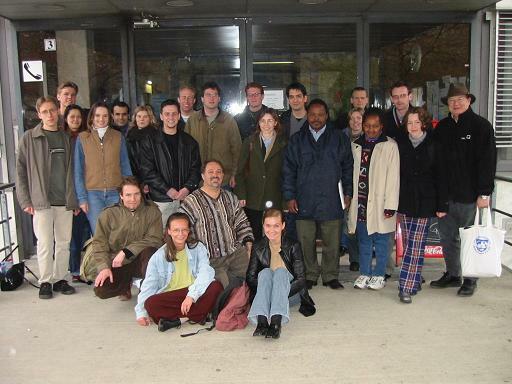 Foreign students came from various continents: Kenya, Mozambique, Azerbaijan, Canada, Switzerland, Netherlands, Colombia, Romania, United Kingdom, Kosovo and St. Lucia. Many of these have travelled specifically to Göttingen just to attend this single course. By writing a final exam students from Goettingen collected credit points towards their degrees, e.g. towards a Master's of Art in International Economics. Many foreign students wrote the final exam and took the credit points back to their home university. The lecture course lasted 8 days, and comprised an intensive program including definitions, causes and the quantitative measurement of corruption. Formal models were applied to shed light on the problems of competition for preferential treatment by public decision makers and the theoretic consequences to welfare of self-seeking among government officials. The calculus of corrupt actors was analyzed as well as the design of corrupt agreements and the transaction costs involved. Classical economic methods were applied hand in hand with more recent approaches such as the economics of criminal conduct, public choice and new institutional economics. Focusing on case studies helped to illustrate theoretical conclusions and provide a vivid real-live impression of the subject. Many participants enriched the course with experience reported from their home country. At some accompanying social events contacts were intensified and the international audience developed into a closely knit network. In an evaluation studnets provided outstanding grades to the course and expressed their satisfaction. An update of the course will be offered in 2003.
impressum Innstr.27 - 94032 Passau - Germany - Fax: +49(0)851-509-2492 - last change 2006/03/14, 17:05.